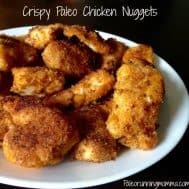 These Crispy Paleo Chicken Nuggets are the perfect healthy answer to that crispy chicken craving we all get! With a savory seasoned almond flour coating, these chicken nuggets are cooked in ghee, making them Whole30 friendly, paleo, dairy free, gluten free, and totally yummy. 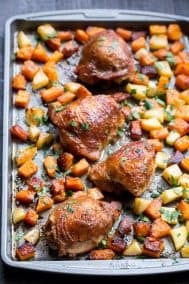 Even now that my kids (and Adam) have been eating mostly paleo at home for over a year, when I ask them for dinner ideas they’ll still come back with things like “baked mac and cheese” “chicken parm” “pizza” “baked ziti” and “chicken nuggets.” I think they all figure that since I can make a paleo version of a lot of old favorites, that I can make anything paleo. As in say a blessing and BAM, paleo mac and cheese. And yes, I realize that there are people that DO make all these things paleo (I hang around Pinterest now after all), but realistically on a weeknight making these a paleo pizza worth eating would be quite the stretch. Remember my Taco Salad from Tuesday? Easy is the rule lately. Truth is, I’m pretty certain they’d want no part of ACTUAL paleo mac and cheese, like with cauliflower or something. Not bashing it for anyone, but I know my family and they would not stand for it. Gluten free we could all handle I think, but that’s for another day and now I’m off topic. The chicken nuggets I knew I could pull off though. If I’ve made crispy paleo breaded chicken before, I can certainly make it in nugget form. I wanted to simplify it though to the best of my ability, and with this recipe it all came together. 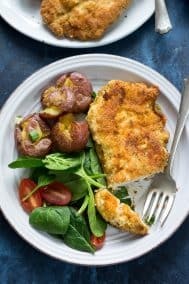 While it does get messy, there are only a few ingredients and a simple method – the same that many people use to make breaded chicken cutlets. 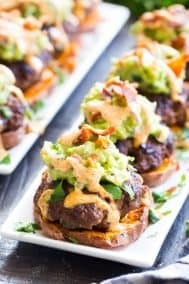 I whipped these up for lunch while my girls were home last week in under 20 minutes and we all absolutely loved them! The third (honey mustard!) which I actually THOUGHT was on the blog but is not, will be posted soon! I was 95% certain I had a honey mustard recipe on here but that is likely just me losing my mind again. For now, we’ll move on to the chicken nugget recipe! It’s so good even on it’s own that I promise you won’t miss the honey mustard! 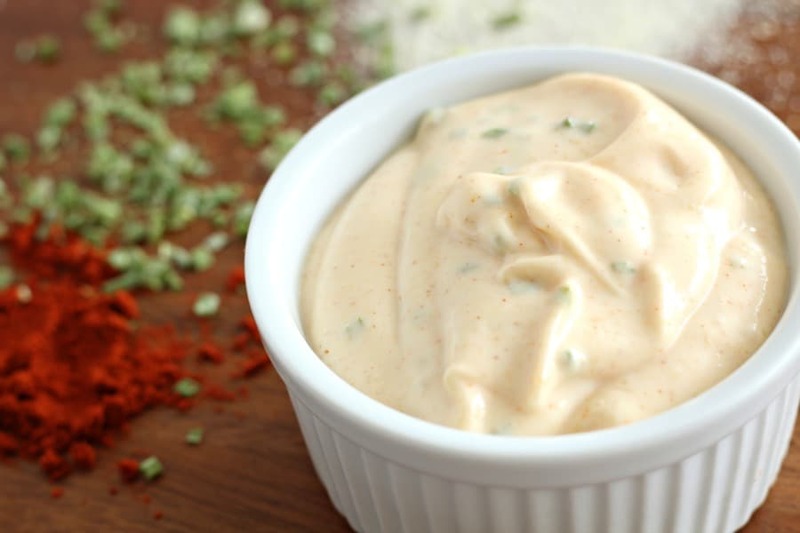 *Updated honey mustard recipe here! Crispy paleo chicken nuggets dredged in egg and seasoned almond flour that will rival any chicken nugget eaten before! 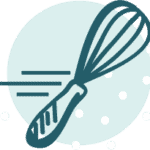 In another shallow dish, whisk the egg. Heat a large cast iron pan over medium heat and add the coconut oil or ghee. 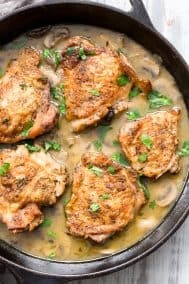 Before adding the chicken, make sure the oil is hot enough by dropping a bit of almond flour in the pan to see if it sizzles. Since the chicken bites are small, you dredge several at a time and it will come out fine. Take the chicken and first coat in egg, then coat with almond flour mixture shaking off extra. Immediately add to the hot pan. Let the chicken cook about 2-4 minutes on each side, or until just cooked through. 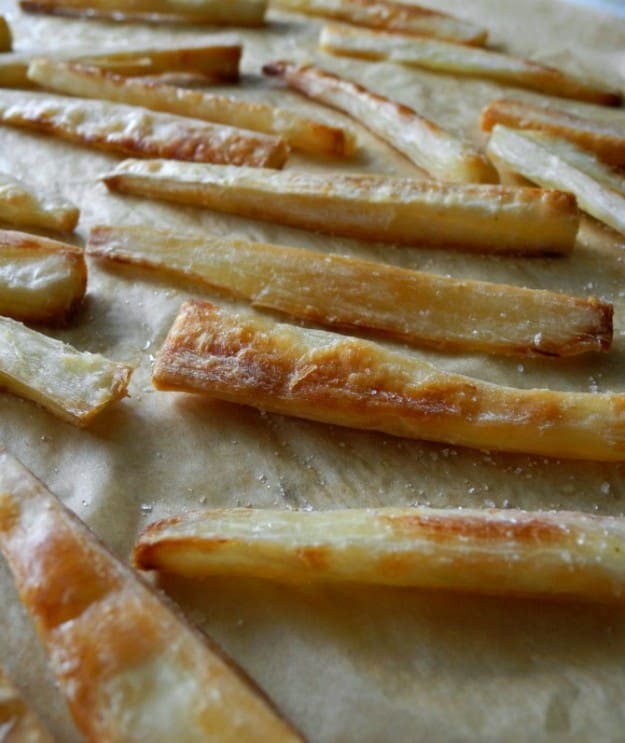 You will have to fry in 2 batches most likely. Adjust the heat to avoid burning the outside and add more cooking fat to the pan if you need to for the second batch. Transfer to a paper towel lined dish to drain excess oil, then serve hot! Enjoy! 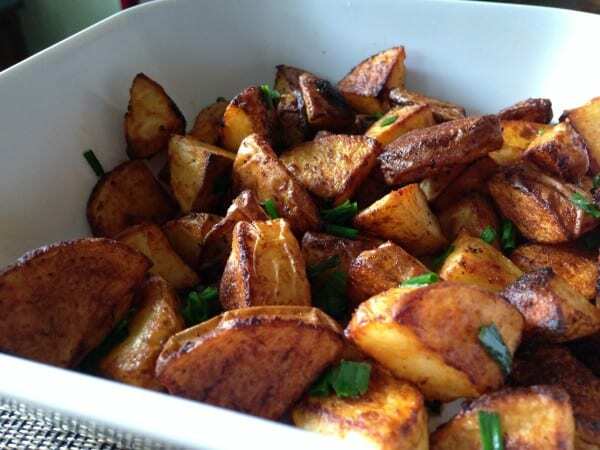 In case you’re wondering what side dishes to serve these with, check some of these out! Given the choice – chicken nuggets or cheeseburger? Always cheeseburger for me. Honey mustard or ranch? This is tough, but I think ranch. Ketchup or barbeque sauce? Ketchup, I’m not a huge barbeque sauce fan. 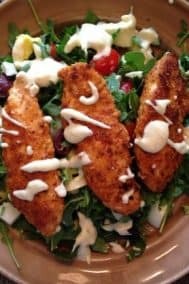 Yup It's About Time...Paleo Crispy Chicken Salad! I like this a lot for my son only I don’t use almond flour around here (afraid of my slight almond allergies) but it’s ok since I am not paleo. 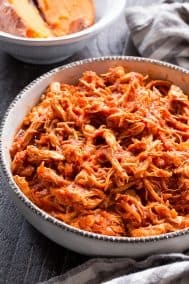 I make something just like this though using quinoa flakes and made a coconut chicken version too using coconut flour and shredded coconut which he liked a lot too. And I love how it comes out in the cast iron pan. Thanks for giving me next week’s dinner for him, I am so short on ideas lately! Oh, I really like bbq sauce, more than ketchup I think now. LOVE a chipotle ranch, that’s my favorite! Chicken nuggets always over a burger. I don’t eat red meat so that was easy! Can’t wait for the honey mustard recipe. That’s my favorite! Oh. My. Goodness. Please come over and fix me the healthiest kid dinner EVER. I want allllll of it. Several years of my life were dedicated to chicken nuggets. I don’t even want to think about what went into them.. I gave up on the frozen ones long ago because the ingredients are a page long and with a bit more effort they can come out just as tasty. My kids really loved these, score! 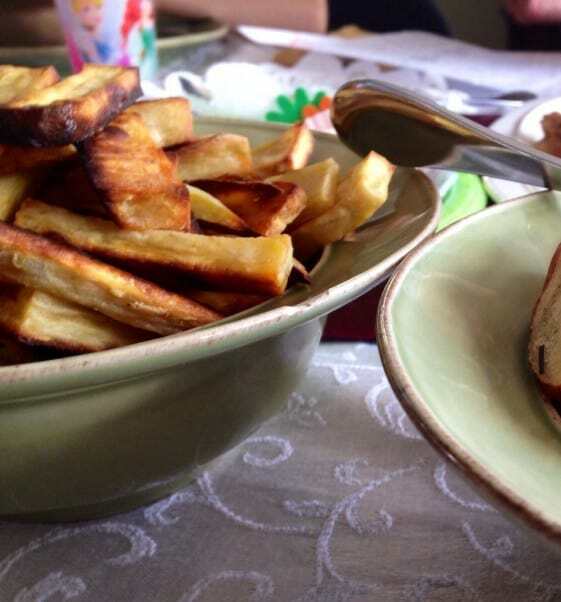 I’m thinking my rutabaga chips need to hang out with your crispy nuggets. yes? dinner party! How perfect would that be?! Yum! Uhm this just made me so happy. I love chicken nuggets (becasue I’m 4) and now I REALLY want some. Can’t wait to make ’em! Honey mustard always wins in our house. 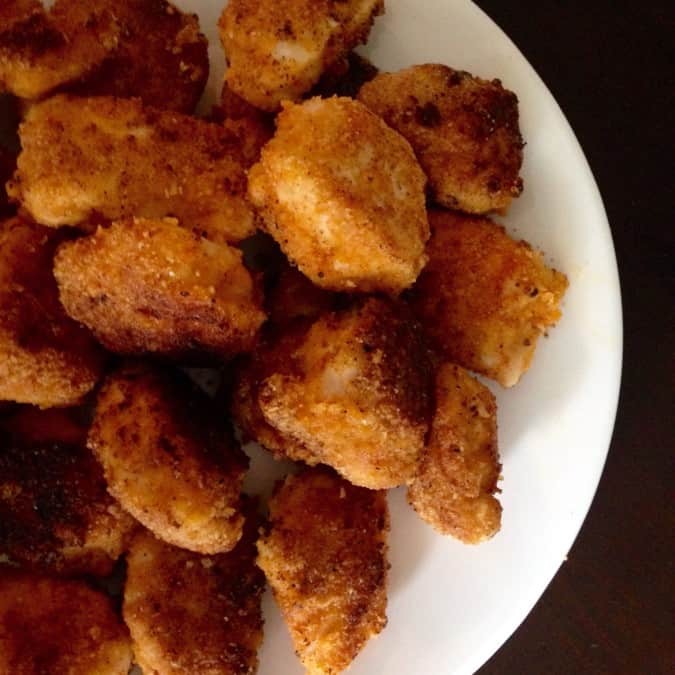 I have never tried to make homemade chicken nuggets before. Do you think this would work with tofu? Just kidding! Even I think that would be gross. I’ve had tofu probably twice in my life and hated it both times 😉 Honey mustard was an old favorite in my crispy chicken salad days! These look gorgeously tasty as always! Your methods are so excellent, I have to try this method with some husband friendly protein, he’d love anything resembling a nugget 🙂 I must agree with you – cheeseburger and ketchup and ranch all the way. Sriracha ketchup is s bonus! Happy Friday! There just something about a burger! I might have to jump on board your Sriracha train, I’m getting curious! Actually that sounds good, I want to try some! You would fit right in at my house, but you’d have to be willing to fight for ketchup! We go through it alarmingly quickly! There is so much debate out there about whether or not creating paleo renditions of foods is a good thing. I just think that if it makes you happy and it works for you- go for it. My mom often makes ‘paleo’ style versions of brownies and cookies and I ain’t complaining. I would definitely go with the chicken nugget and ketchup combo. I think ketchup goes good with everything ;). When I started out with paleo I was on the “don’t do it” side of that debate, but, I’ve loosened up since 🙂 Now I just think of it as making tasty treats using things I’m eating anyway. If the brownie tastes good AND it’s made with coconut oil, score! Honey mustard is at the top of my list! Just made it actually, and recipe will be up next week! Kids are so high maintenance! Who do they think they are?!?! Lol… 🙂 This recipe looks good, Michele. Your kiddos are lucky to have you for their mama. Chicken coated in anything, may it be nuggets or tenders or a chicken breast. I’ll take all those dips. Ketchup, bbq, honey mustard, (vegan) ranch 😉 But ketchup will always be numero uno! Thanks for this recipe! I love love love this paleo pizza recipe. I have been making this for over 2 years now. I will check that out, thanks! That’s awesome, so happy to hear!! This recipe is just out of this world! I’ve made it twice now, and it will be my go-to chicken nugget recipe. Only change is that I find I only need about 1 cup almond flour. Thanks for the amazing recipe! These nuggets turned out perfect! Thanks for posting the recipe with awesome photos. So thrilled you liked them Alicia! 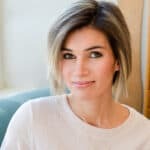 My daughters are the runners, but I’m the Paleo mama. They think I’m nuts! This recipe was awesome. I didn’t have any onion powder so I substituted garlic salt and I just fried the tenders as strips and saved cutting time. Not equals but very yummy. 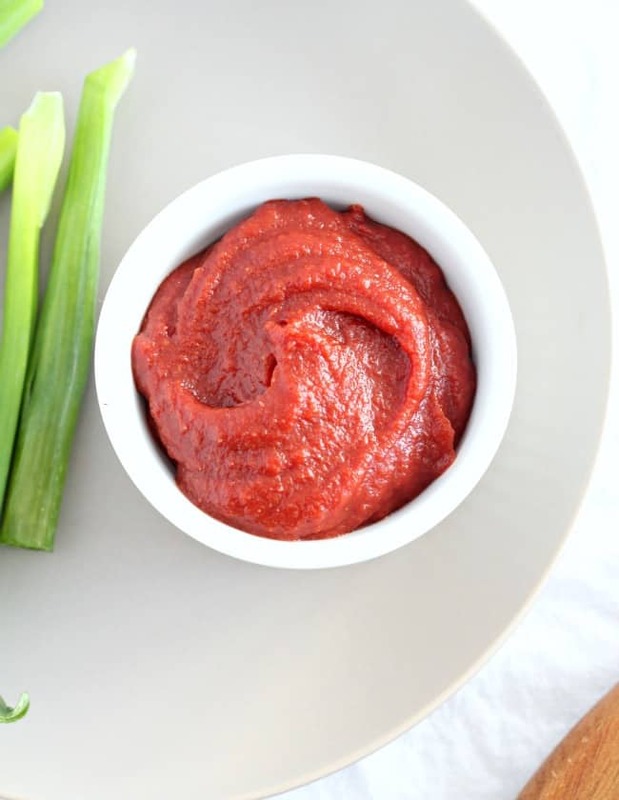 I love love love smoky paprika and use it in everything I can. I’ve made similar chicken strips but this turned out to be the very very best yet! I couldn’t really taste the spices by themselves, but the blend was unforgettable. I will make these again and again. Thanks. The kids are coming to visit next month so will make these for them. Pretty sure I won”t get any complaints. Also pretty sure they will want the recipe. We love smoked paprika here too! Really thrilled you like these! This is one of our absolute favorites (although I LOVE every recipe of yours!). Where can I find nutrition information? The link doesn’t seem to work unless I’m missing something. Thank you! This was declicious! 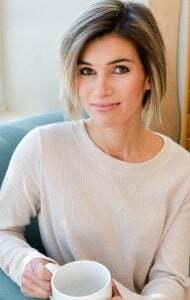 I follow SCD and my family usually suffers because their diets end up restricted. However, everyone loved these nuggets! They were devoured almost before I could fry them! 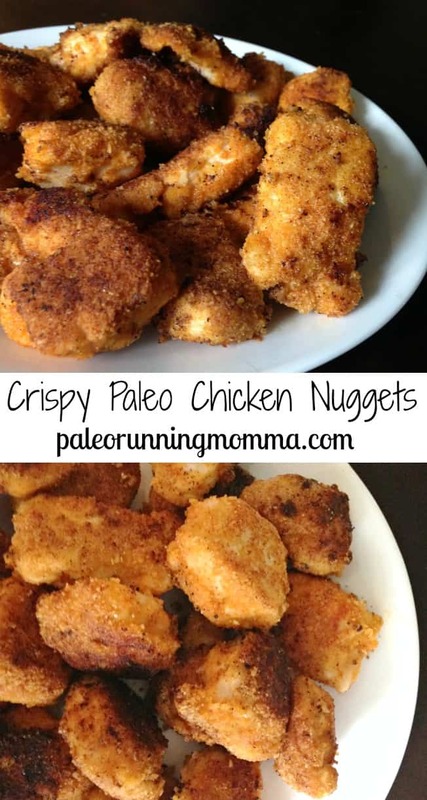 Better than any packaged or fast food nuggets for sure! Thank you for a great recipe. 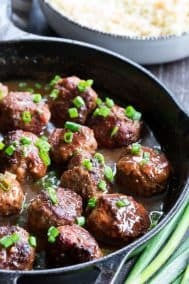 I am following the Plant Paradox (not Paleo) and was happy to find this recipe compliant with my plan! My husband and son loved them as much as I did! These were amazing. A must go to recipe from now on! I am eager to try these. Do these freeze easy if I make a bunch ahead for my kids to enjoy later. As a working mom food prep is a big deal. Thank you! Hi, Can you please email me or list the Nutrition label? Thank you! I would love to try this. 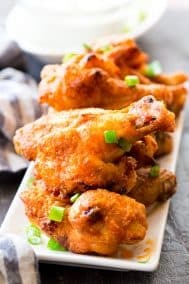 Any idea how long you would cook in air fryer? Recipe was most definitely a HIT! thank you so much! !